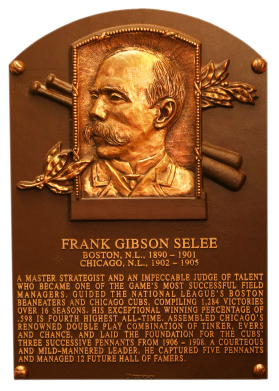 Comments: I purchased my first Perez-Steele Frank Selee postcard on eBay in December, 2004 (along with a Rube Foster, Larry MacPhail, Bill Foster, Bill Veeck, Lee MacPhail, Tom Yawkey, and William Hulbert) from seller Ron Copeland (Copeland Online Collectibles). The card was submitted to PSA and graded NM-MT 8 in October, 2005. In February, 2012 this PSA 10 popped up on the bay from seller 4 Sharp Corners as a Buy It Now. I snagged it! There's just one card issued contemporary to Selee's career with a single known example - a 1904 Allegheny. Of all of the “home made” cards, these are the most artistic. The players are all from the deadball era, and they are beautifully illustrated. There are no write-ups on the backs, because they didn’t do that back then. Ars Longa look and feel like 100 year-old cards - but they are unlikely to ever reach that milestone, due to the limited lifespan inherent in the inks used. Ars Longa are the class act among home made cards. But, no matter how attractive they appear, they have no collectible value as a card. The reason is that they are produced on an inkjet, thus there is an unlimited print run, and anyone can reproduce them cheaply. The other and more important reason is that digital inks are water-soluble, and the air is filled with tiny molecules of water. Light also breaks down the inks, as does ozone – two things which are omnipresent, even in the most controlled environment. These factors will eventually dissolve the ink. This will occur within somewhere between 10 and 100 years in a museum setting, much sooner at home. The cards will never survive long enough to acquire any age-related value. 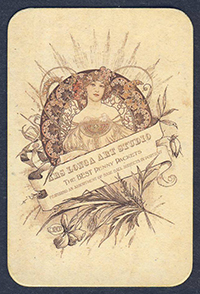 Ars Longa Art Cards are, according to their web site, printed with the highest quality pigment inks on the finest 24 mil, acid-free archival card stock. They further state that “all materials are chosen for their quality and ability to withstand the tests of time, storage, handling, and display.” According to Wilhelm Imaging Research, pigment ink on acid-free card stock will last 6-8 years under normal conditions before noticeable fading begins. The upper range, under museum conditions, is going to be 28-55 years, according to Wilhelm. That’s just not good enough. However, I would bet these cards are still going to outlast all other home made cards, because they are made better. They are also sprayed with an art spray which provides more protection. In spite of all of this fine workmanship, they still won’t be around in 100 years. The card stock used is of a perfect thickness and feel. There is no laminating. The cards often have rounded corners, and are slightly “distressed” by the maker. Because the cards are so nicely made and actually feel and look old, a novice could easily buy one, thinking he is buying something that is over 100 years old. However, a close examination of the card backs will reveal the printing date in Roman numerals. At least Ars Longa isn’t using some old cardmaker’s name (like Helmar and Sporting Life), and they aren’t copying old Topps and Bowman designs (like Lemke). They are doing their own thing, and doing it well. I find myself awarding three stars to cards which have no collectible value, only because these cards are probably valuable as folk art, and because they are original works and beautiful to look at – and because the subjects are mostly players you can find nowhere else. Each piece is manually distressed to create a timeless & attractive one-of-a-kind work of art with an authentic vintage appeal. 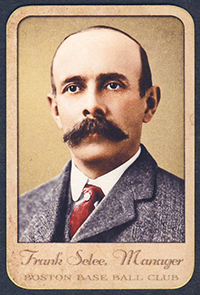 Features portraits of ball players and baseball dignitaries spanning the era from 1875 to 1899. Represents countless hours of research. If you own an image that would fit well into this series, I would very much like to talk to you. This series currently contains 117 subjects, but will be expanded to 140 in 2015. Inspired by studio portraits and carte de visites (CDVs) of the era.